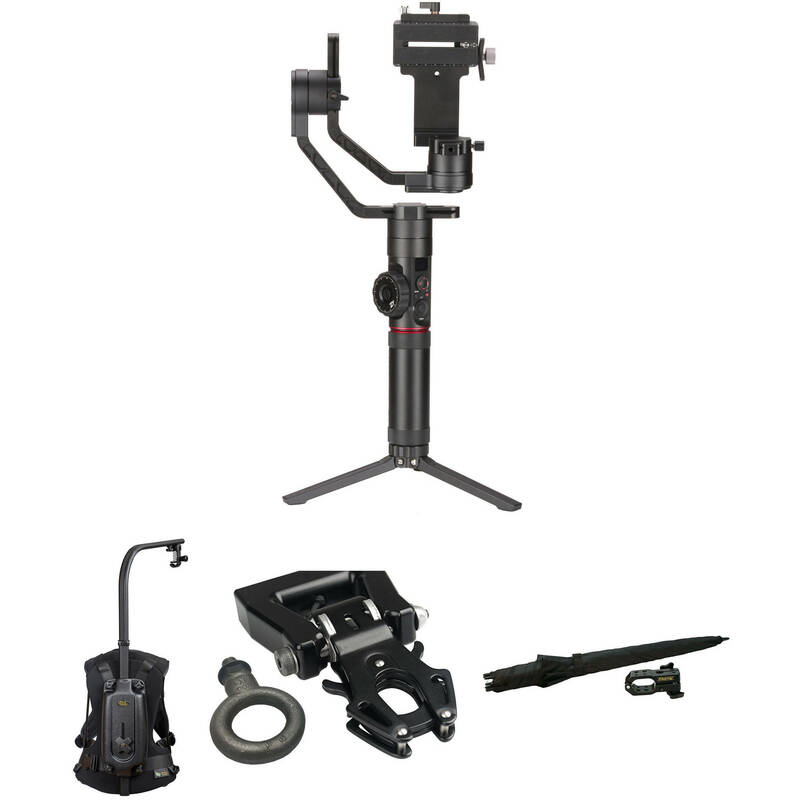 The Zhiyun-Tech Crane-2 & Easyrig Minimax Kit with Kong 3/8"-16 QR Adapter and Umbrella from B&H allows you to use the Crane-2 3-Axis Gimbal Stabilizer attached underslung to the Easyrig Minimax for comfortable operation. The Kong Quick Release Adapter secures one to the other. The adapter comes with a 3/8"-16 eyebolt that you can screw into the bottom of the Crane-2. Then secure the adapter to the eyebolt. The umbrella comes with a holder that attaches it to the Minimax to protect from rain when you're shooting outdoors. The Crane-2 supports up to 7 lb loads and features digital follow focus control for select Canon DSLRs. Useful for documentaries, news, events, and more, the Easyrig Minimax is great for situations which require extensive handheld camera work with cameras weighing from 4.4 to 15.4 pounds. Rather than uncomfortably handholding your camera, supporting the weight with your arms, the Minimax redistributes the weight of your camera setup through the body harness. Taking the weight off your arms lets you hold the camera steady for longer periods of time without fatigue. An added bonus of the Minimax is increased stability in your shots. The support rope, while transferring the weight to the harness, also adds a point of contact, reducing vibrations. Replace the original camera hook that comes with your Easyrig gimbal with this heavy-duty Kong Quick Release Adapter from 16x9. Simply untie the original hook from the top line and tie it to the top of the Kong adapter. The quick release aluminum clamp makes it easy to attach and detach your camera from the gimbal with a pinch. The adapter comes with a 3/8"-20 eyebolt that screws into the top of your camera, cage, or handle to provide a secure connection to the clamp. Use the Easyrig Umbrella with Holder for Minimax to keep rain off your camera operator and your Minimax-mounted camera. This 51.2" wide, 32.7" long umbrella can also be used as a sun shield on daylight exterior shoots. The Umbrella mounts on the upper arm of your Minimax and its holder sports 1/4"-20 and 3/8"-16 threads for attaching accessories. The holder also incorporates a hole for mounting a lighting stud, enabling you to add an Obie light or a work light to the rig. This is the weight without the vest. Please see the vest weight below. Box Dimensions (LxWxH) 26.5 x 15.3 x 12.6"
Box Dimensions (LxWxH) 5.3 x 3.3 x 1.0"
Box Dimensions (LxWxH) 32.5 x 28.1 x 22.2"
Crane-2 & Easyrig Minimax Kit with Kong 3/8"-16 QR Adapter and Umbrella is rated 4.3 out of 5 by 352. Rated 1 out of 5 by Margaret from Crane 2 Follow Focus Does Not Work and No Support I'm an amateur so assumed it was user error but i can not get the follow focus to do ANYTHING. I'm using Canon Rebel T4i (so it's compatible) and it's in manual focus (as directed) and I know the cable is good because I can control on/off via the handle but the follow focus wheel does absolutely nothing and that was the reason I went with this product.? There is ZERO customer service from the parent company, the USA subsidiary or the US distributor Tocad.? BH gave me a phone number and email address - no response for 2 weeks from either.? I even tried the online chat at Zhiyun and they referred me to an email address - that came back as failed.?? Needless to say, I am not pleased. Rated 5 out of 5 by Augusto C from Exelente Producto Saludos a todos. despus de un tiempo de anlisis me compre el crane 2 y creo haber tomado una buena decisin, lo he trabajado en varios eventos usando la CANON 6D con lentes 24-105 f4 y 50mm 1.4 y trabaja perfecto, tambin la uso con la canon XA-10, la cual es una cmara de video con entradas XLR, esta cmara me gusta el color y calidad de imagen, solo que cuando la trabajas totalmente a mano y caminando ( por supuesto caminando adecuadamente ) no me gusta el resultado, he llegado a la conclusin que el estabilizador de la canon xa10 es muy malo, pues usando esta cmara con el crane 2, asunto solucionado, trabaja de maravilla con un foto y estabilidad y me evite comprar otra cmara. Rated 5 out of 5 by Sues L. from Love this with my whole heart!!! So I've been looking for an 3 axis gimbal for the past few month and couldn't decide. I finally came across the Crane and it was love at first site. I looked at all kinds of youtube video reviews which made me want it more and more. When I finally bought it I took it out before even leaving B&H. I was surprised how easy it was to balance it before even using it. I first put my a6000 on it and tested it out then my canon 70d. The modes are awesome and easy to change and the panning and tilting are as smooth as a babies bottom. I really don't have anything bad to say coming from a glide cam. LOVE THIS PRODUCT! Rated 5 out of 5 by Chris W. from Perfect DSLR Gimbal I love this thing. I had the crane 1 ver1, and this is a perfect upgrade if you want to fly a heavy DSLR. I love the tripod legs, the motors are strong (however you have to change the strength setting from weak to strong if you are using a heavier DSLR). It is slightly heavier and bulkier than the previous version, but that's not a complaint, just an observation. Nobody should complain about the weight or size. Be grateful that this technology has come so far that instead of using a $10,000 enormous two-handed gimbal, you can use this under $800 single-handed, easy to use gimbal. God Bless America...and China. Rated 1 out of 5 by Gavin from Total BRICK on day 1! Most of the favorable reviews for this on YouTube seem to be from people who were given a free one. I bought based on that and it was a mistake. The Crane 2 has a nice build but terrible software and support. Most of the features only work on Canon. So dumb. But I could live with that. Do not buy this direct, or you may be bankrupt in return shipping.I go to? On day 1 I go to update the firmware and it's bricked instantly. I find many other similar reports. Zhiyun does nothing, no solutions, just send it back, Thankfully I bought it from B&H and they covered international return shipping. I reviewed it in detail on my youtube channel. Rated 5 out of 5 by TRH from Every Filmmaker Has to Have One of These! This is the perfect gimbal for any filmmaker or wedding videographer. It is perfect for run and gun type shoots. I like to be ready and on my feet for any task. This gimbal allows me ready for anything. It's size lets me be discrete and a non distraction during wedding shoots. I don't need a crazy two handed gimbal or even a body attached steady cam to get the smooth glide look. If you are having trouble deciding on which gimbal to buy, I highly suggest this. It's so much cheaper than the high end gimbals yet it has the same exact high end results! Easy set up and easy to use. This is a MUST BUY FOR FILMMAKERS and WEDDING VIDEOGRAPHERS! I have used this with a Canon 5D 4, is the same lever of control over camera settings through the Crane possible with a Canon 6D 2 also? The Zhiyun-Tech Crane-2 works with all recent Canon EOS cameras in pretty much the same way. You will see a similar if not exact performance on the 6D Mark II. Is there an option for tracking shots on this model? Tracking is not listed as an option for this gimbal. Which cameras does the follow focus work with? Please, could someone tell the dimensions of the Crane 2 (in same position like when you put it inside tha Carrying Case) WITHOUT the mini-tripod?Because I need to know if it fits inside another case.Thank you! The Crane 2 dimensions are: without tripod=18, with tripod=24, Width=10. when you say Limited 1-Year Warranty , what do you mean with limited ? A Limited 1 Year Warranty means that for one year, the product warranty is limited to any manufacturer defects. Does the follow focus work with Canon T5i? Canon EOS cameras such as the Canon T5i are supported by he Crane-2. Is this stabilizer compatible with the Sony AX100 4K Ultra HD? I saw reviews of the original Crane. It was not compatible. You could mount it, but the viewfinder would interfere with the full motion of the gimbal. The Crane v2 was reviewed as fully compatible. Yes it does work with an AX100 with full motion without the camera hitting the gimbal, it is a challenge setting up the zoom and start stop function. Initially go into the AX100 menu and system settings select USB LUN setting and select 'Single' Connect then connect the camera to the Crane with the Sony cable provided, Turn on the crane first, then turn on the AX100. Works fine.